The son of Presley Marion Rixey, Colonel, United States Marine Corps, he was born on 17 November 1904 in Yokahama, Japan, where his Father was stationed at the time. His father was the nephew of Presley Marion Rixey, Rear Admiral, United States Navy. Although the Rixey family has been prominent in America for many generations, little has been found to date regarding General Rixey's life and service in the Marine Corps. Should you have any biographical information about him, kindly forward same to the Webmaster via e-mail. The General's headstone indicates that he served both in World War II and in the Korean War. 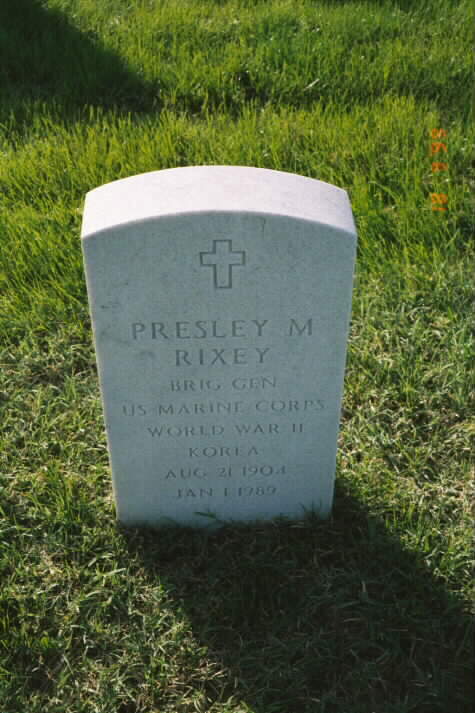 First Battalion, Tenth Marines (World War II): Commanding Officer, Lieuenant Colonel Presley M. Rixey.